This is the title of a book I read as a young teenager. I don’t remember exactly what ‘happened’ but there was murder, mayhem and derring-do and some smart-arse teenager saved the day. 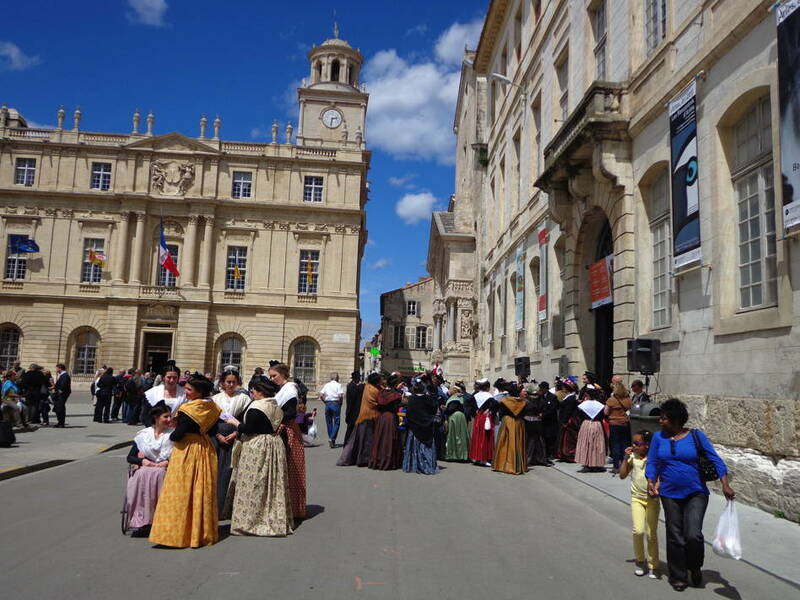 Anyway it made a great impression on me and I’ve wanted to go to Arles ever since. It’s a lovely city but nothing of great note to be seen except a well preserved Roman Arena – still in use. There’s also a fantastic Saturday market at which you can buy virtually everything. We restricted ourselves to veg and a small coffee percolator (for Kazakhstan). Dressed for Church in Arles - not sure what they were about! 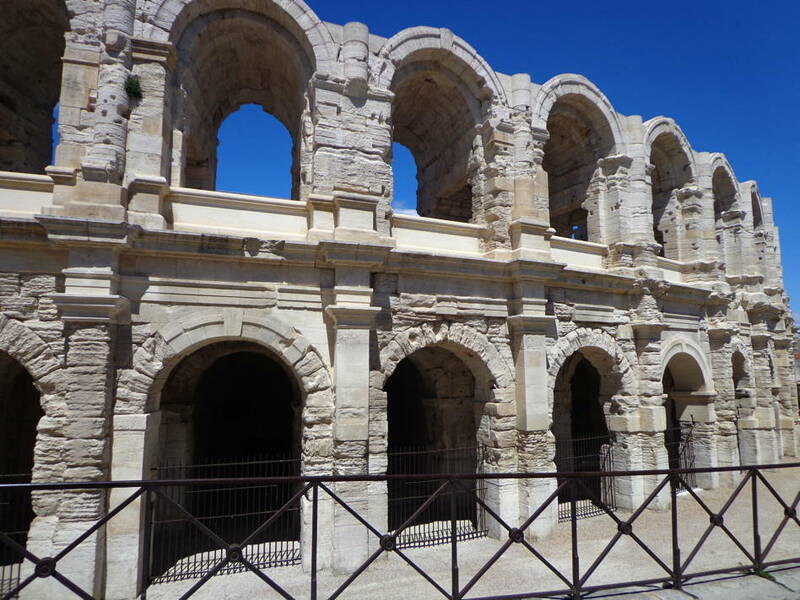 We spent a day in Nîmes and were enchanted by the grand buildings and cleanliness and neatness of everything. 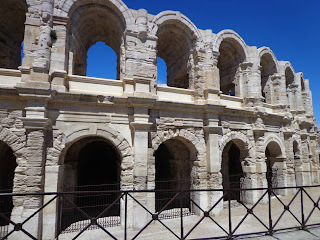 There was a real mixture of architecture from neo-Romanesque, neo-Gothic, Paladian and of course Roman (in the form of a 2000 year old Roman arena). 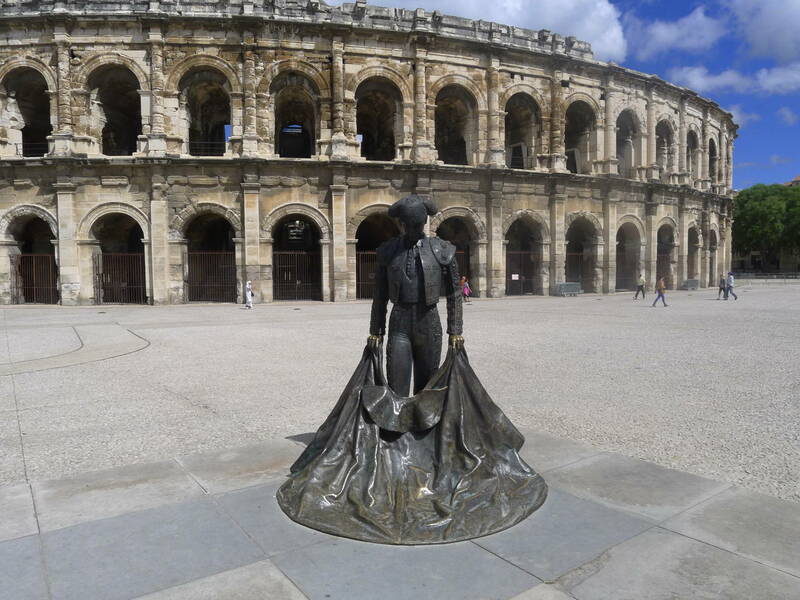 Nîmes of course is famous for the invention of denim (Serge de Nîmes), was developed to clothe slaves in the US. 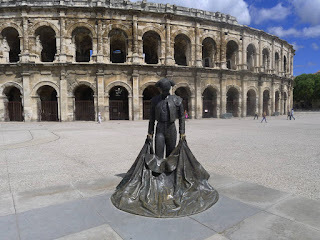 Roman Arena in Nimes is still used for bullfighting. 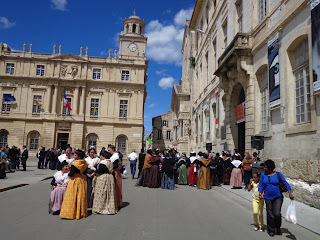 Sunny Square in Nimes - Lawrence on far right having a beer. 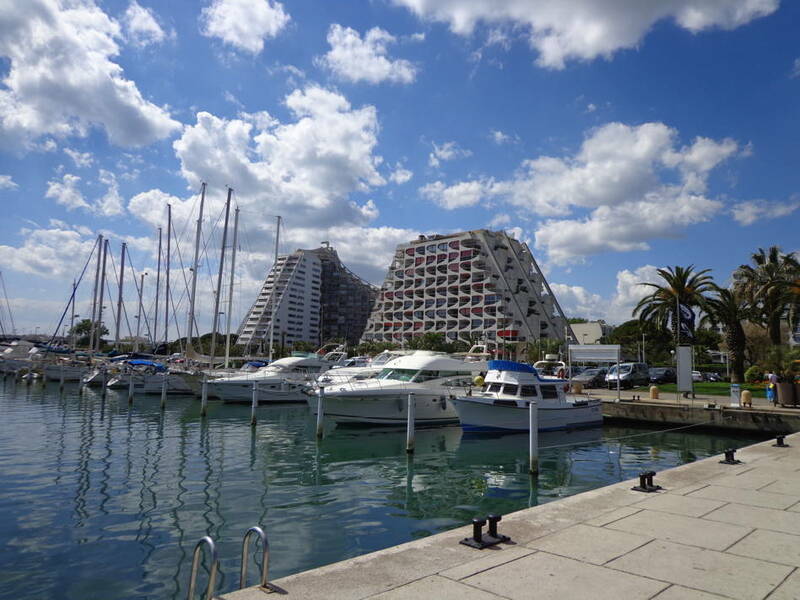 We are very close to the Camargue area and of course Lawrence wanted to explore it. It’s vast wetland that is sanctuary for birds. “Oh great’ I thought “more bloody ducks.” However, it was absolutely wonderful. It was teaming with flamingos, which I absolutely love. Their barbie doll pink beaks are a colour that you just don’t expect in nature. We also saw a whole raft of interesting birds including Eagle Owl (huge), heron, egrets, swans, storks (white and black), ducks (of course), stilts and some funny looking Coypu, something like an overgrown water rat. There was the usual raft of geeks with their enormous lenses which seemed a bit of overkill since you could almost touch the damn birds they were so close. 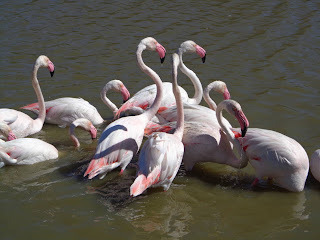 This flamingo photo was taken with a tiny pocket size camera! Before arriving here we spent a few days in Lunel, between Nîmes and Montpelier. We drove down to a town a called La Grand Motte (meaning The Big Lump). It was straight out of an Austin Powers movie. The whole thing was designed and built in the 60s, so very dated now, but somehow it all worked and we rather liked it. At least there was thought put into the design and layout, rather than just haphazard throw together boxes. 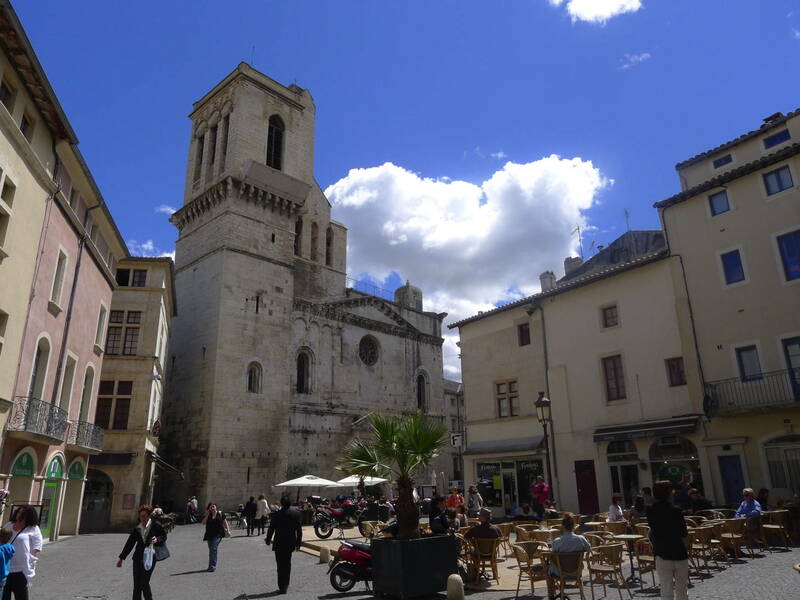 The town of Lunel was fairly typical French regional town with a good market and restaurants. Nice to wander around but wouldn’t write home about it. From here we go to Avignon and the Rhone Valley – for further education purposes. Glad you two are still having fun!